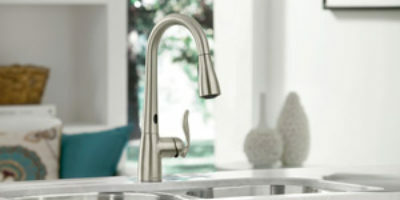 The Leland model from Delta features two versions – Touch2O and Standard model, both looking the same and only differs in the style for turning on the flow. The Touch20 version, unlike this one, is very modern and features almost everything a faucet might have these days. The Standard style model is much more traditional than the Touch2O. It has a traditional line and will fit perfectly in a kitchen with the similar interior. 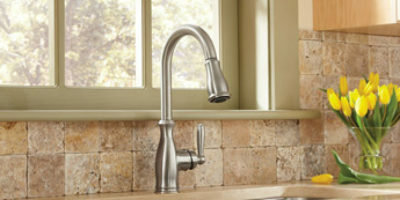 For those that prefer the faucet to be completely in the same style – traditional, this is probably the better version. In this version, the water flow is turned on from the handle and it lacks the modern features the other version has. There are no sensors and there is no touch option for turning the water on and off. This means no batteries are included, and there is no need for them. No worrying if something will get broken or damaged too. The rest is pretty much the same as the first model we mentioned. There’s the Touch clean technology that allows the user to clean the spray holes with a simple touch and get rid of the calcium and lime that is built up there. There’s also the MagnaTite system that Delta uses for lots of their models. This system allows the spray head of the hose to be placed back on the spout with ease and have maximum efficiency while doing it. The system uses magnetic force that is placed on both sides so you just need to get the spray head close to the spout and the magnets will do their job perfectly. Then, there is the Shield spray technology that creates a perfect flow for cleaning the dishes with perfection. It is a special flow and a trademark for Delta that is excellent for washing the dishes without making a mess around the sink. The faucet can be mounted on either one or three holes – it’s up to you. It is versatile and easy to be installed. The design is completely the same as the Touch2O model with the difference that there are no sensors to detect the touch of your hand. This might be a big deal for some, but at least it is way more affordable than the other model. Made in a traditional style, with lines that remind of your grandma’s place and the kitchen in which you had the best meals in your life. The body of the faucet along with the handle and the spray head has a beautiful line that people who love the traditional style won’t be able to resist it. On top of this, there are four different finishes for everyone’s taste – the Venetian Bronze finish, Chrome, Arctic Stainless, and Spotshield Stainless. With them, you can be sure that you’ll find the best look you need. 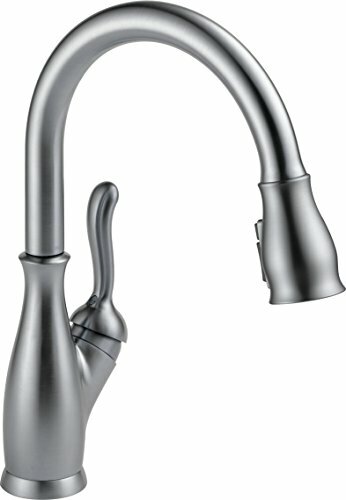 Even though the touch option is not present here, this still is a pretty good kitchen faucet overall. At the end of the spout, there’s the spray head on which a 20-inch hose is connected. This might be too short compared to the competition, but it’s still a hose that will be of use in many situations. On the spray head, you can see a button which is really something that you won’t find at your grandma’s kitchen, but hey, it’s the 21’st century, a mix of traditional and modern is something everyone’s trying to find. With it, you can control the water stream and change it to one of the three options available – the standard stream, spray, and the special spray shield technology. The spout swivels for 360 degrees and together with the hose, we can say that nothing will be out of reach. The spout reaches almost 15 inches in height and has 9.2 inches reach which is perfect. 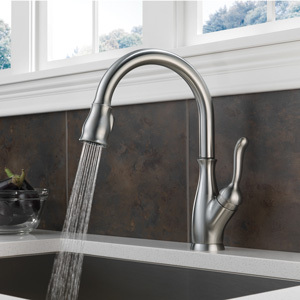 You have a beautiful traditional model that will do everything you need around the sink.